The Cohiba Behike 56 is a very rich and complex medium bodied Laguito No.6, 6.5” (166mm) long, of 56 ring gauge, and comes in a 10 cigars box. It comes in a gorgeous sleek black box that has a fabric underside and a magnet latch. Released in 2010, the Behike 56 is part of the Behike series, the most exclusive series from the Cohiba brand. The BHK 56 is longer and of larger ring gauge than the BHK 52 and BHK 54. Habanos SA wanted to redefine the standard of Cuban cigars and thus released these amazing cigars. It comes in a gorgeous sleek black box of 10 that has a fabric underside and a magnet latch. Like the BHK 52 and BHK 54, the tobacco leaves used in the filler of the BHK 56 are, among others, of medio tiempo, which are the top two leaves that grow at the very top of some tobacco plants. Slightly larger and longer than the BHK 54, very impressive cigar. • Very creamy cigar but with rich grassy, earthy flavors. This is a very beautiful cigar. The construction is impeccable. It has a beautiful wrapper, practically flawless, veinless but slightly bumpy, and has slightly darker color than a Colorado wrapper. And there is a very nice little pig tail at the cap. The band has an awesome finish with two security holograms on it; it comes off without much effort and without damaging the cigar whatsoever. The texture is fabulous. 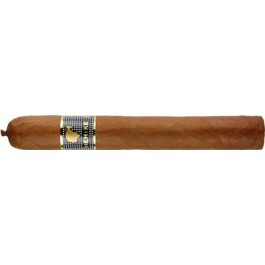 The cigar has a slight spongy feel while still being very firm when squeezed; it is almost hard. Slightly bigger than the BHK 54, it is an impressive cigar to behold. Amazing grassy aromas mixed with cedar, nutmeg and hints of spices emanate from the wrapper and the foot. Cutting the cigar is very easy. The draw is very open. Each draw lets out lots of velvety and thick smoke. The burn line is even and neat throughout the cigar. The cigar builds up a nice solid ash that can be up 2 to inches in length, and won’t fall unless you flick it. Right off the bat, the cigar provides excellent flavor. It greets you with a nice complexity, with flavors of lattè, cedar and earthy. There is a good amount of black pepper as well. This cigar is very smooth and creamy at this point, like the BHK 52, it is a medium body cigar. There is also a nice sweetness in the first third, from some maple syrup-like flavors. All these aromas make a pleasant combination that lingers on the palate. In the second third, the complexity of the cigar is still there; all the aromas are now more powerful than in the first third, and blending nicely together. Through the middle third the woodsy tones become more present, but strong earthy flavors remain. Each draw releases a generous amount of white velvety smoke. The draw remains open and consistent throughout the middle third. In the final third, the BHK 56 reveals its true self, a real Cohiba, but with stronger and bitter aromas than the average vitola. While the same flavors from the previous third persist, the earthy tones crank up a notch. The spices of black pepper encountered in the first third come back with a full swing towards the end. All those flavors wonderfully combine into a cohesive mixture that is incredibly enjoyable. No flavor overshadows the others, they all come together beautifully. It is a pleasure to smoke this cigar until the nub, where hints of spice, that of typical Cohiba, reveal the full complexity of the BHK 56. In summary, this cigar is an exceptional Cohiba, a very smooth, never too strong but that has great tasting flavors. It goes especially well with special occasions. Its perfect construction and flawless balance will delight you; from moment you open the beautiful lacquered box to the moment you have to let that beautiful cigar in the ashtray.